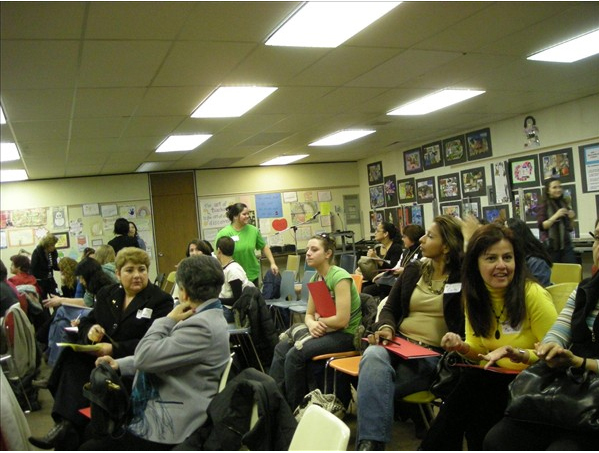 Working Women Community Centre is a stronghold providing services to newcomer and immigrant women and their families. On March 31st, I sat down with Director of Programs & Services Adriana Beemans to hear exactly how WWCC keeps up to date and continues to serve the community. we find in our programs is that once people start participating, art helps feed the soul and support holistic personal growth – which is a really important part of settling in a new country. If you just focus on the basic needs you don’t have places to be creative and deal with broader issues. How does Working Women Community Centre support such a large range of people? We serve immigrant women and their families. So we definitely serve men and boys as well. I think the primary focus is entering that process through the woman. The challenge is that programming differs between age groups and on top of that the skill set of staff. The other range is ethno-cultural groups. We have staff that speak 21 languages to access those populations. The needs, interests, and assets of one age range aren’t the same as the others. What a young mother is dealing with and facing is very different from a senior immigrant woman. The needs, interests, and assets of one age range aren’t the same as the others. What a young mother is dealing with and facing is very different from a senior immigrant woman. What has allowed WWCC to remain active over 30 years? In the past 10 years WWCC has expanded significantly from an organization of 8 – 10 staff to about 100. The key thing that has allowed us to stay successful is to keep abreast of trends in the refugee and immigration sector, the funding, and policy environment. Other key things are to provide wraparound supports and a suite of programming that is not limited to a narrow definition of settlement, integration or support services – to meet the needs of the whole person. It’s not just providing information or a referral, but the areas that they would like to develop and explore. It’s about being innovative and thinking about what different participants say and how they want to improve. Another key thing is that we provide a lot of support and training for peer leaders; a lot of our activities are volunteer driven and self-run. How does WWCC work with and support volunteers? The most important challenge is making sure they have meaningful experiences. They want to volunteer and have it be relevant and lead to another work opportunity. So the challenges are identifying the right volunteer activities. It’s a lot of coordination and upfront interviewing and understanding what they’re interested in. But also the support and coaching that goes throughout that process. For us the demand is really high for volunteers from our communities. Most of our volunteers are our clients as well. For us the demand is really high for volunteers from our communities. Most of our volunteers are our clients as well. What are the obstacles and successes associated with WWCC having 4 locations throughout the GTA? The challenge is to ensure there is similar organizational culture. Each site can get it’s own culture which makes sense, but making sure they each feel part of the same organization. Also just staff feeling connected to one another. You have staff from one site who never see staff from another site. But the ability of being a city-wide organization is that we can respond to needs and keep abreast of an idea that’s working in one area to be transferred to another. There’s a lot of learning and sharing between sites. But also recognition of the complexity of the clients and of the identity. If you’re only working in one area your experience can be framed by your client group. Here in the downtown we primarily see a lot of Portuguese, and Spanish immigrants, but up in North York it’s a very different client group. It’s great because it allows you to see some issues that are the same, but some are completely different . How does WWCC reach out to the local community to attract new members or clients? The biggest thing is word of mouth. We’ve been in this location for 30 years and probably a third of our staff have been previous volunteer summer students, or clients themselves. We really try to reflect the population we work with and serve, and that is one of the ways we do outreach. Also we sit on a lot of service networks and planning collaborations, and have staff funded to engage other organizations for partnerships. We use the animator model to hire for key projects locally from the community. How does WWCC incorporate arts programming? We see art as a key engagement mechanism – if you are a newcomer immigrant it’s not always prioritized, because it’s about finding employment, learning the language, or affordable housing. But what we find in our programs is that once people start participating, art helps feed the soul and support holistic personal growth – which is a really important part of settling in a new country. If you just focus on the basic needs you don’t have places to be creative and deal with broader issues. We run arts programming in our North York site where the community garden is kind of like an extended living room. People don’t just do food stuff there, they also come together, they celebrate. We were working with an artist to explore immigrant women’s experiences as cleaners through self expression. It’s a powerful way for immigrant women to tell their stories and to reflect on them. Robyn Shyllit is a graduate of the Nova Scotia College of Art and Design, and a student in the Cities Centre Community Development Program at the University of Toronto completing a Masters degree in Planning. This entry was posted in Interview and tagged community development, complimentary funding, immigrants and newcomers, Working Women Community Centre by Neighbourhood Arts Network. Bookmark the permalink.